This season at Tottenham, there’s been something missing. In the summer, we put our faith in athleticism, at the expense of guile and creativity. Since we loaned out Holtby, Eriksen has been our sole creative force in midfield. The team has been lacking in ideas, falling back to basic tactics – endless crosses and long balls. On Sunday Sigurdsson showed that he could help add some of this missing ingredient. The Icelandic midfielder was part of the reason for our more positive second half performance, as well as scoring the dramatic last minute winner. His career at White Hart Lane seemed to have stalled. With all the new additions in the summer, it looked likely he would leave. Now he’s made a strong case for inclusion in the team. Previously, he has been used mainly on the left of midfield and, apart from a few useful goals, he hasn’t contributed a great deal. Here he replaced Dembele in the centre. It seems he’s more comfortable there. 2. Bentaleb, perfect for LvG? A common strategy for teams coming to White Hart Lane has been to use energetic pressing to stop us moving the ball out of defence. I have lost count of the number of times the ball is played to our centre backs and they either end up giving it back to Lloris or hit a long ball up field. As demonstrated here, playing Bentaleb in a withdrawn role provides a possible solution. He offers something different to Sandro, less a defensive shield, more a link between defence and midfield – distributing the ball, recycling possession and keeping the team moving. In fact, something similar to the key deep lying playmaker role favoured by supposed Tottenham managerial target, Louis van Gaal. Ironically given his links to Sherwood, the young Frenchman may be one of the biggest beneficiaries if the legendary Dutch coach does end up at White Hart Lane. Van Gaal has a reputation for bringing through youth prospects and Bentaleb would certainly suit his playing style. 3. Soldado, still adapting to the Premier League? At the weekend, Soldado had a good game, particularly when linking up with Christian Eriksen. However, Southampton were very aggressive when dealing with him and the referee didn’t give him much protection. At one point from a goal kick, a Southampton defender appeared to have his arm around the Spaniard’s neck. Another occasion saw him bundled over. The officials were unmoved. It’s clear he’s not Adebayor, but is he particularly lightweight or just not used to the Premier League? Would some of these challenges have been given as fouls in La Liga? In the second half things improved. More balls were played to feet. Perhaps the introduction of Sigurdsson helped. We have two very different strikers and we must vary our tactics depending on which one plays. We should use this variety to our advantage. One area we urgently need to strengthen is at fullback. Naughton had impressed in recent games, but here he made mistakes that led to both goals. Rose seems lacking positionally, and too small and lightweight. Often the opposition target him. Walker is a reasonable player but he needs backup. Maybe some of our youth prospects will come good, but in the meantime we need some more experienced options. What is Sherwood doing defensively? We seem to be playing an even higher line than AVB’s infamous tactics. At least the Portuguese coach knew that to make it work, you need to put pressure on the ball. In the first halves against Arsenal, Benfica, Chelsea and Southampton, we have given the opposition midfield all the time and space they needed, to thread balls through and get in behind us. A mixture of bad finishing and the alert Hugo Lloris have prevented us from being fully punished but with a visit to Anfield on the horizon, it’s a little concerning. Southampton’s attacking trio of Lambert, Lallana and Rodriguez were full of invention, movement and energy at White Hart Lane, especially in the first half when Spurs were lacking all three. They were very unlucky to finish on the losing side. Lallana looked particularly bright. Not only do Southampton have one of the best attacking trios in the Premier League, unusually it is 100% English. The watching Roy Hodgson, must surely take all three to Brazil. Lambert appears to be fighting Andy Carroll and Peter Crouch for a place on the plane. He might not quite offer the height and bulk of the other two, but he more than makes up for this with his extra mobility and touch. Southampton’s second goal was set up by their big centre forward, in the process he showed the quick feet and vision lacking in the other England contenders. A player who will be sadly missing from the World Cup is Christian Eriksen. Denmark failed to qualify. His performance on Sunday was truly fantastic. I waxed lyrical about him in my match report on the game. He was notionally positioned on the left, but ended up playing more of a free role. He was everywhere, involved in everything. 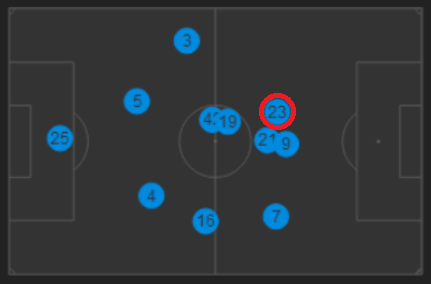 Below is the average position map for Tottenham during the game, Eriksen is circled (from the excellent WhoScored.com). Notice how central he is compared to Lennon (number 7) on the other wing, and how close he is to Chadli and Soldado. He does leave the fullback fairly exposed, and Rose didn’t have a great game, but going forward it was certainly effective. Looking at the statistics, Eriksen had the most shots, shots on target, key passes, crosses, overall touches and of course goals, of anyone on the pitch. Winning is very important but supporters ultimately follow football for entertainment. Exciting forward play, plenty of goals, amazing comebacks and last minute winners, certainly help the public perception of a manager and his team. As most fans only go to home games, home form is particularly important. In this respect AVB is a cautionary tale. When he was sacked we had a reasonable points total and Tottenham were fifth in the table, close to fourth and not too far off the top of the league. Sterile football, a lack of goals, thrashings by City and Liverpool and, in particular, bad home form, ultimately cost him dear. As I mentioned in my review of the game on Sunday, watching Spurs hasn’t been much fun of late, and matches like the win against Southampton – despite the dodgy defensive performance – can only help. This entry was posted in General Thoughts and tagged Christian Eriksen, Danny Rose, Kyle Naughton, Nabil Bentaleb, Roberto Soldado, Sigurddson, Southampton, Spurs, Tottenham Hotspur on March 26, 2014 by Jon @ AnythingButPenalties. With each game at Wembley, I miss White Hart Lane all the more.